What is the most important thing when joining Google+? It’s not finding friends or family, though you might think so, especially if you’re used to using Facebook. Fill up your profile’s “About” page with photos and information about who you are, where you work, what your hobbies and interests are. This will help you to find like-minded people among the Pluserati, i.e. the other G+ users. The more you share about yourself, the better. Make sure the photos you use are big enough and not blurry. Your Twitter profile pic is probably too small. I use a 300 kt pic, the minimum is 250 pixels. Spice up your profile with your own banner image! - If you plan using text, make it large enough to show also there. It's your 2-second pitch; Make it understandable and clear when people mouse over your name, to get them interested. For the profile avatar: If the image is too large, it gets resized automatically and there is a possibility to crop it further. Leave some room around your logo or face shot because it gets cropped further for the circular avatar. Flower shots make nice cover images! Employment – Think carefully what you write here because the text is shown on your ‘hovercard’. This is a big factor when deciding whether to add someone to circles or not! You can make the text quite long, but be careful not to bore or overwhelm the possible followers. Make it snappy, like an alligator sandwich. Use just 20 characters or thereabouts, or it won't show well on your hovercard. Take note, only you can decide who will see this information from the drop down menu of each area. Is it you only, your circles, extended circles or the whole wide world. You can also choose ‘custom’ and set it, just like sending a private message to your circles or persons; +name, name the persons or choose specific circles. Occupation – This is important what you write here as it will show on your hovercard when people mouse over your name. For these two last mentioned bits you can simply fill in the name of the company you work for but as there is space for more, I recommend adding at least your position or speciality. Then again you can go with Student or Self-employed, Professional Techie or World’s Greatest Lover. If you leave these two empty, then your hovercard or ‘blurb’ will show the text from the top of the page, under your name. Your Google+ profile page has a section called the 'Tagline', where you can add a brief description of yourself. Click the space and write; don’t make it too long. I recommend making it public for ‘anyone on the web’, as it will be your personal 'headline'. If several people have the same name, this is what distinguishes you from the rest. This text is shown on your hovercard, so keep it short: About 20 characters or thereabouts, or it won't show in full. Have a look at other people’s hovercards, this is my assignment for you. Here is an excellent blog post by Robert Wallis for all of you Blueheads or SelenaGomezes out there! 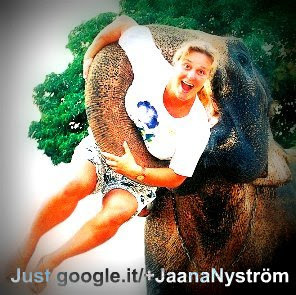 My profile photo was taken in Thailand: The elephant was then 60 years old and the mahout or trainer was 70. They had spent their whole lives together, at first working hard the teak forests in Northern Thailand and then taking it easier near Pattaya with the tourists in a show, after they retired. I was working as a tour guide for a Finnish charter company at the time and was a regular visitor with my groups. 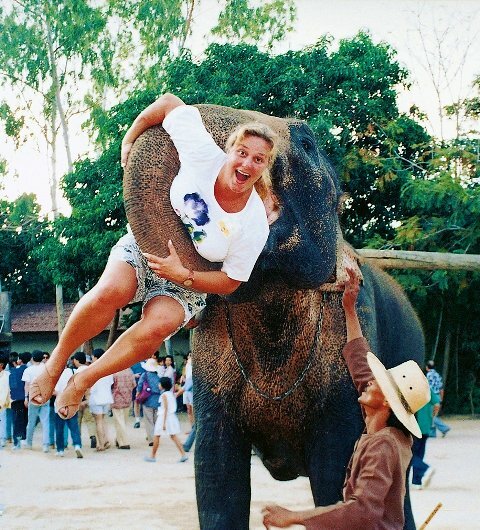 So the locals took me in the show frequently and the elephants got used to me. I had been massaged by the elephants, stepped over, fondled, played soccer with them until one day... This old guy came to me and asked if I wanted to try out something new. I said, why not, of course. He then made me stand in front of the beast and told me to stand absolutely still and just wait. Suddenly I felt a gentle nudge and a trunk embracing me. The hold tightened and I was up in the air, my feet dangling in the air nearly above people's heads! Woohoo, talk of an adrenaline rush! I have really tried to get my photo updated but all the mahouts nowadays are fairly young (in their 30's to 50's) and have spent much less time with their charges: They are afraid/unable to get their elephant to do what was done in the original pic. So in a way, it's a photo of the century. Has your "Avatar" a story attached? Share it on your profile page and with the Circleverse! Of course, if you don't wish to reveal anything about you, this post is not for you so just skip it. There is no must on Google+. Though not showing us who you are, makes me wonder why you are in Social Media in the first place? Let's forget the people perhaps persecuted because of their opinions in their countries, okay? Thanks for the post, ill go back and double check mine, been a while since I set it up.